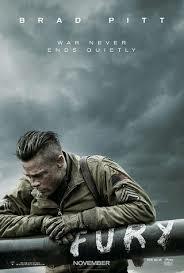 So, just saw the movie Fury yesterday, it came out this weekend. It was a great movie, I loved it. It was about a WWII tank crew in Germany in 1945 as they moved across the country to meet up with another battalion. It was a very realistic war drama, and what I mean by that is that even though the war and fighting scenes were awesome, the deep conversations and emotional themes were almost more powerful. I thought the acting was great as well, Brad Pitt was great, and surprisingly Shia Labeouf had a stellar performance. Like I said, one of the best parts of the film was how deep it went, and how realistic it felt. It wasn’t just about the action and shooting and firing missiles out of tanks, it was also about the emotional and moral toll that war has on a man’s life. And now for the disclaimer, there will be a few spoilers in this review! The film starts with the tank crew of Fury returning to a US base camp in Germany. One of their assistant drivers has died so they return to recruit another, only to find out that a new recruit has been placed with them. Logan Lerman was just a typist before being enlisted only weeks beforehand. He’s never even seen the inside of a tank, let alone fired a gun. As the crew of Fury continues to haze Logan’s character, Norman, he is continually tested as they force him to kill a captured, unarmed German soldier. The film follows his progression from timid freshman to another numb enemy killer. Once they begin to accept him into the family of Fury, together they become an effective killing machine, especially in the final battle scene. Without giving a plot synopsis of the whole entire movie, it has a very realistic and sobering view into the life of a soldier amidst a brutal world war where moral lines are blurred and ideology becomes confused. One part that I really enjoyed, or maybe appreciated, is how much they talk about God and the Bible. It’s mentioned frequently and in a serious tone, not making fun of it. You don’t see that a lot in other war movies, or at least I don’t. It’s also a tale of male bonding during times of extreme tests and trials. Overall, I think it’s a great film, and I really enjoyed it, it was unpredictable and I never knew where the movie was going to go next. I’ll give this movie a 4 1/2 out of 5 stars, I was immersed into the setting and time period and felt like David Ayer, the director, was authentically showing how they felt, in turn, making me feel the same way. I endorse this film, go see it! Next Post Interstellar, not worth the journey?